King Sleep soundly in comfort and style with waterbed sheets from Kimlor. 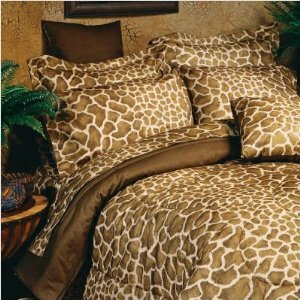 The Giraffe Waterbed Sheet Set features a bold giraffe print design. Made of a cotton and polyester percale blend, this sheet set will create a rustic look in your bedroom. The set consists of a flat sheet, fitted sheet, and pillowcases (the Twin size includes just one pillowcase).